A friend from our local homeschool group sent this meditation to our e-mail list. I thought it was worth sharing. Thank you Thea. Jesus speaks to Sister Josefa and she records His words about His passion. “And I washed the feet of my apostles with my own hands, so that those who have consecrated themselves to apostolic work may follow my example, and treat sinners with humility and gentleness, as also all those that are entrusted to their care. I girded myself with a white linen cloth to remind them that apostles need to be girded with abnegation and mortification, if they hope to exert any real influence on souls. . . I wish also to teach them mutual charity, which is ever ready to excuse the faults of others, to conceal them and extenuate them, and never to reveal them. Lastly, the water poured on the feet of my apostles denotes the zeal which burned in my heart for the salvation of the world. 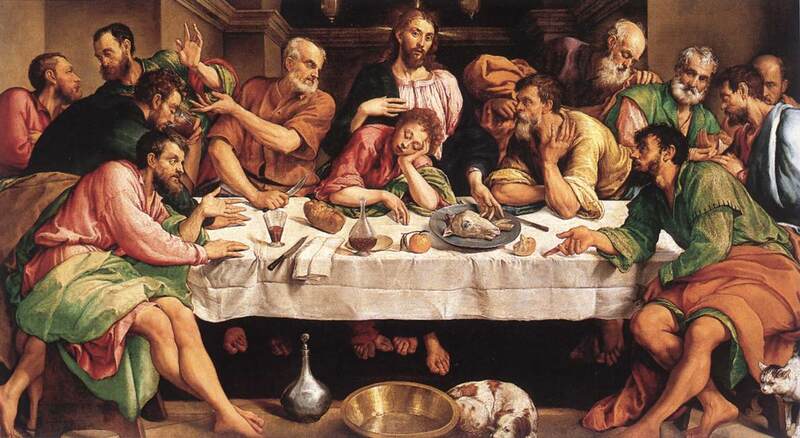 “I want to tell them of the poignant sorrows which filled my heart at the Last Supper. If it was bliss to think of all those to whom I should be both companion and heavenly food, of all who would surround me to the end of time with adoration, reparation and love . . . This is no wise diminished my grief at the many who would leave me deserted in my tabernacles and who would not even believe in my real presence. The holy Eucharist is the invention of love. . . I live in the midst of sinners that I may be their life, their physician, and the remedy of the diseases bred by corrupt nature. And in return they forsake, insult and despise me! You dear souls, why coldness and indifference on your part? . . . Do I not know that family cares, household concerns, and the requirements of your position in life, make continual calls upon you? . . . But cannot you spare a few minutes in which to come and prove your affection and your gratitude? Do not allow yourselves to be involved in useless and incessant cares, but spare a few moments to visit and receive this prisoner of love? When about to institute the Holy Eucharist, I saw the privileged throng who would be nourished by my body and blood; some would find there the remedy for their short comings, others consuming fires for their imperfections. . . I likewise saw them gathered round me as in a garden, each separately rejoicing me with her flowers and their scent . . . As a vivifying sun, my sacred body gave them life and warmed their cold hearts . . . To some I went for comfort, to others for refuge, to others again for rest. . . Would that all these cherished souls knew how easily they can console me, harbor me, or give me to rest their God. And while I looked at those many souls that would feed on this heavenly Bread, I could not but see also the indifference by which so many others . . . Consecrated souls . . . Priests . . . Would wound me in this sacrament. Their were those who would grow cold, gradually yielding to routine, to weariness and lassitude, and little by little to tepidity. Still, I wait all night and watch in the tabernacle fervently hoping that she will come and receive me. That she will converse with me with all the trust of a bride. Telling me of her sorrows, her temptations, her sufferings, and asking my advise and begging for the graces she needs for herself and others. Perhaps she has dependent family or in her family souls that are in danger and far from me? Come I say to her, let us discuss everything with perfect freedom. Be concerned about sinners. Offer yourself to make reparation. Promise me that at least today you will not leave me alone. Then see if my heart is not asking something more of you to comfort it. This is what I hoped to obtain from that soul and many another. Yet when she receives me in holy Communion she barely says a word to me. She is distracted, tired, or put out. Her whole mind is absorbed with her occupations, her family cares, her acquaintances or maybe anxiety for her health. She dose not know what to say to me, she is indifferent, bored, wished it was time to go. It is thus that you receive me, O soul whom I have chosen and for whom I have watched with all the impatience of love throughout the livelong night? Yes, I yearned for her coming that I might rest in her and share in her anxieties. I prepared fresh graces for her, but she dose not want them. She has nothing to ask of me, neither advise nor strength, she just complains to herself without so much as addressing me. Alas, that soul dose not possess the delicate love I had hoped to find in her. I withdrew into the garden of Gethsemane, that is to say into solitude. God is to be sought within away form distraction and noise. To find him the soul must enforce silence on all the disturbance by which nature often fights against grace; on interior arguments prompted by self love or sensuality. These constantly tend to stifle the inspiration of grace and keep her from finding God within. It is thus I offered myself to carry out the redemption of the world. At the same moment I felt all the torments of my Passion burst overwhelming upon me. All these suffering thronged before my eyes and pressed upon my heart while at once and the same time I saw all the offenses, sins and crimes that were to be committed throughout the ages. Draw near me, and when you see me submerged in an ocean of grief, rise, and go with me to the three disciples whom I had left a stone’s throw away. I had chosen them that they might share my agony, pray with me and by their company afford me some consolation. What were my feelings to find them asleep? O the pang of loneliness, and to have none to share in my sorrow. How often my heart suffers this same grief, how often, hoping to find solace among the souls it loves it finds them slumbering! Beloved souls learn from this how useless it is to seek comfort from creatures. I went back to my prayer and again falling on my face I worshipped my Father and implored His help. I did not call Him “My God” but “My Father,” it is when harrowed with pain that you must call God your Father. Beg for His help, expose your woes, your fears, your longings, and let your cry, of anguish remind Him that you are His child. Tell Him that your body is exhausted, your heart is sorrowful even onto death. That your soul is experiencing what seems a very sweat of blood. Pray with a child’s confidence and expect relief from your Father’s heart. He himself will comfort you and give you the strength necessary to endure the tribulation of suffering.